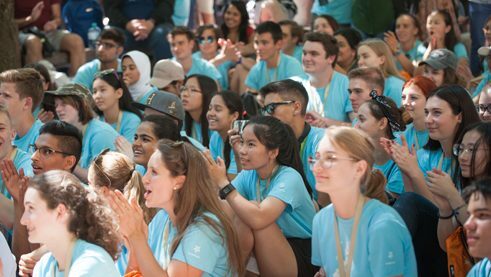 More than 140 teens took part in the 2018 International German Olympics (IDO – Internationale Deutscholympiade) in Freiburg. They experienced fourteen unforgettable days full of creativity, friendship, culture, and lots of fun. The IDO programme was full of variety and challenges, but all the participants came with huge motivation. Freiburg’s Mayor Martin Horn didn’t pass up the opportunity to personally greet his international guests. The IDO was also a special event for the city of Freiburg. 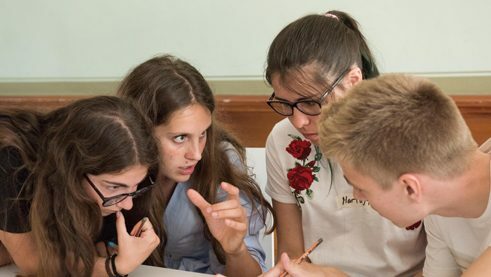 For the first time, local schools were involved, enabling encounters between German and international young people as well as their 65 accompanying teachers. The competition itself was first and foremost an exercise in participation and imagination. Three tasks had to be mastered: a collage as an individual work, a presentation, and an illustrated story by international groups. The spirit of IDO 2018 was characterised more by team spirit than single combat, more by creative collaboration than competition. Gold in the respective language levels A2, B1, and B2 went to Pinprapha from Thailand, Austeja from Lithuania and Diana from Ukraine. But actually all of the pupils won as one big IDO team, or so it felt from the jubilation at the award ceremony: the awarding of the Fairness Prize to Øyvind from Norway garnered the biggest applause. Beyond any political rhetoric on intercultural dialogue, integration, and the widely discussed question of an open society in Germany, the IDO is one thing above all: an encounter between people. “No colour, no religion and not even one language is worth more here than another. Here we are all the same,” says Gülrem from Cyprus. Hilola from Uzbekistan is especially thankful for the German language, explaining, “German has given me so much! Being able to be here now and make friends with everyone else in German. I’ve never met so many different nationalities in my life.” Hilola would like to come back, preferably to study journalism. Then, with a good education, she would like to get something started in her homeland. 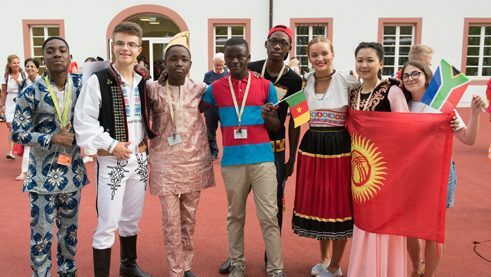 Participants during the evening of nations at IDO 2018 | Photo: Andree Kaiser For the grand finale there was a highly acclaimed concert and DJ night with the young band ok.danke.tschüss. “Zusammen” (Together) by Clueso and the Fantastic Four boomed from the speakers at the Goethe-Institut Freiburg: Wir sind zusammen groß / Wir sind zusammen alt / Komm lass’n bisschen noch zusammen bleiben / Vorbei ist die Zeit in der man keinem mehr traut / Falls sie dich fragen “Bist du allein hier?” / Sag ihnen: “Nein,denn ich bin mit allen hier.” (Together we’re big / Together we’re old / Come on, let’s stay together a little longer / The time is over when we don’t trust anyone / If they ask you “Are you alone here?” / Tell them, "No, I’m with everyone here.”) “Zusammen” was the anthem of the IDO 2018, because by the end, everyone, really everyone could sing along. Aimée Torre Brons is a freelance author, editor and cultural and media manager who is in charge of press relations for the 2018 IDO project.